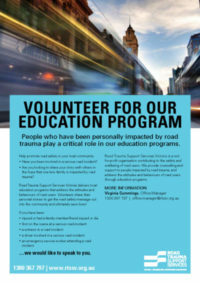 Road Trauma Support Services Victoria (RTSSV) is committed to educating the community and raising public awareness about road trauma and how it affects people’s lives. We do this by positively influencing driver attitudes and behaviours with the aim of reducing crashes and the resulting trauma. RTSSV delivers a range of educational services that reach more than a thousand people each year. Road Trauma Awareness Seminars (RTAS) are delivered in conjunction with the Magistrates’ Court of Victoria to traffic offenders as part of sentencing options. RTAS has been growing for more than 10 years and is delivered in 31 locations across Victoria each month. The 2019 calendar is available now. Accelerated InSight is a two-session program delivered to repeat offenders in conjunction with Community Corrections Services Victoria. Education sessions for community and business organisations as part of a proactive Occupational Health and Safety Strategy. Please email us a completed booking form in WORD or PDF to secure your booking. An opportunity for sporting clubs and community groups to look at road safety with their peers and leaders. The Best Drive Ever program can complement programs such as ‘Good Sports’ and ‘Looking After Your Mates’. Please email us a completed booking form in WORD or PDF to secure your booking. We have specific programs aimed at young people about driving safely. If you’re a young person wanting to make a difference, teach or work with young people and would like to see this program in your school, youth group or a community organisation please email us a completed booking form in WORD or PDF to secure your booking. We can provide information sessions for a community group, for example, Rotary, health organisations and speaking groups. Please email us a completed booking form in WORD or PDF to secure your booking. People who have been personally impacted by road trauma play a critical role in our education programs. Help promote road safety in your local community. Have you been involved in a serious road incident? Are you looking to share your story with others in the hope that one less family is impacted by road trauma? …we would like to speak to you! If you are interested in volunteering as a speaker, download a position description in Word or PDF. For more information on any of our education services, please contact Chris Harrison at chris.harrison@rtssv.org.au or 1300 367 797.